How to change the serpentine accessory belt on a 10th generation 2009-2013 Toyota Corolla with the 2ZR-FE 1.8L I4 engine and A/C. This automotive "how-to" guide was specifically written to assist owners of the tenth generation (2009, 2010, 2011, 2012, & 2013) Toyota Corolla in changing the serpentine accessory belt on the 2ZR-FE 1.8 liter inline four cylinder engine. Owners of other Toyota, Scion or related vehicles equipped with the 2ZR-FE engine such as the Yaris, Matrix, xD, Allion, Premio, Auris, Lotus Elise and the Pontiac Vibe may also find these DIY instructions to be helpful. If your original belt has many large cracks, chunks missing, a glazed appearance, frayed edges, looks dry rotted, makes a squeaking or chirping noise or a squealing sound when you rev the engine, it probably needs to be replaced. The tools needed to remove the old belt and install a new one include a 12mm socket, a 14mm socket and a 3/8" drive ratchet. The replacement serpentine accessory belt that I purchased for my "Made In Canada" (A.K.A "North America") 2010 Corolla S with A/C (Air Conditioning) and can recommend is the Goodyear Gatorback part number 4060485. If your 09-13 Corolla was built in Japan, the correct Goodyear Gatorback poly-v belt is part number 4060480. Other compatible belts with their part numbers include the following: Bando 6PK1220 (Japan built models), Bando 6PK930 (without A/C), Toyota # 90916-02679 (North America built models), Roadmax 6K480AP (with A/C), Gates K060365 (without A/C), Gates K060480 (with A/C) and Dayco 5060480. Please verify the correct replacement belt part number for your Corolla by calling your dealership, consulting with an automotive parts store or by using the Amazon Part Finder website since it may vary by model year, trim level, engine type and whether it was built in North America (Canada) or in Japan. You can tell where your Corolla was built by checking the VIN number under the windshield or in your vehicle records. If the VIN starts with a 1 or 4, it was built in the USA. It it starts with a 2, it was built in Canada. If the VIN starts with a "J" then it was built in Japan. Some parts for the Corollas made in "North America" are different than for the Japanese built models. The first few steps are to open the hood, gently pull off the plastic engine cover and set it aside in a safe place. Then move to the left (passenger) side of the engine bay and locate the alternator at the top of the engine. Unlike our 2005 Corolla which has a spring loaded automatic tensioner arm with the "fake bolt" for releasing the tension, the newer 09-13, 2014 & 2015 models use a long bolt in a bracket attached to the alternator for tensioning the belt. There are three bolts that need to be loosened before you can pivot back the alternator, create some slack in the belt and remove it from all four pulleys. The one 14mm bolt is located at the bottom of the alternator with the head facing towards the passenger side of the vehicle. I labeled the 14mm bolt location on Picture # 6 in the row above. The other two bolts are both 12mm and located at the top of the alternator. One 12mm bolt is situated perpendicular to the car with the head facing towards the passenger side of the vehicle. The second 12mm bolt is the long tensioner adjustment bolt which is parallel with the vehicle and the head facing towards the front bumper. The two 12mm bolts are labeled on Picture # 7 in the row above. First loosen the 14mm bolt at the bottom of the alternator by rotating it counterclockwise (push the wrench back towards the rear of the vehicle). You only need to loosen the 14mm bolt a few turns so that the alternator will be able to pivot back freely when you loosen the two bolts at the top. Next loosen the 12mm bolt on the bracket attached to the alternator. It is situated perpendicular to the engine with the bolt head facing towards the passenger side of the car. Turn the bolt counterclockwise a few turns with the 12mm socket and ratcheting wrench. Then loosen the long 12mm belt tensioner bolt at the top of the alternator that runs parallel with the engine by turning it counterclockwise. Once you have loosened the tensioner bolt enough, you can push on the alternator to pivot it back towards the rear of the engine. Before you remove the old belt, take a minute to study how it is routed around the four pulleys (crankshaft, compressor clutch (A/C), water pump and the alternator. A good rule to remember is that the ribbed inside of the belt gets wrapped around ribbed pulleys and the smooth outside of the belt goes around the smooth pulley. If you have trouble pulling the old belt off, you may need to rotate the tensioner bolt a few more turns in the counterclockwise direction and then firmly push back the alternator. Slip the old belt off the alternator pulley and then off the other three pulleys before removing it from the engine bay. Inspect the old belt for cracks, chunks of missing rubber, frayed edges or glazed surfaces. If the belt is in relatively good condition, you may want to keep it for an emergency situation just in case the new belt happens to snap or fail early. 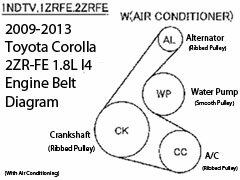 Here's a small belt routing diagram for the 2009-2013 Corolla with the 2ZR-FE 1.8L I4 engine with air conditioning. Click on the small thumbnail to view a larger version of the picture. I'd recommend buying the Bando 6PK1220 belt since it has the best reviews on Amazon. After you've studied the belt routing diagram, lower the new belt down on to the left side of the engine. You can choose to either begin by wrapping the new belt around the alternator or down at the crankshaft. I chose to start with the new belt around the alternator pulley at the top of the engine and then down over the large crankshaft pulley. Then I wrapped the belt around the compressor clutch pulley for the A/C system at the lower front area of the engine and finally behind the smooth water pump pulley just below the alternator. Double check that you have routed the new belt correctly. Firmly pull the alternator forward to pivot it away from the engine and remove the slack in the belt. Continue tightening the tensioner bolt in the clockwise direction with the 12mm socket and ratcheting wrench until you reach the clean shiny threads on the bolt that indicate the OEM position. A good trick for checking the belt tension is to grab it in the middle of the longest span (between the alternator and crankshaft). Then see if the belt can be turned 90 degrees but no further. It should be relatively difficult to turn and become very difficult to turn once you approach 90 degrees (perpendicular). Once you are satisfied with the tension on the new belt, you can tighten the other 12mm bolt and the lower 14mm bolt. Rotate the 12mm bolt just below the long tensioner bolt in the clockwise direction (rotate the wrench towards the front of the car) to secure the bracket to the alternator. Then tighten the 14mm bolt at the bottom of the alternator by turning it in the clockwise direction (towards the front of the car) to secure it to the engine. Double check that the bolts are tight and that the new belt has proper tension before moving on to the next steps. Start the engine and listen carefully for any strange squeaking, squealing or chirping noises. If you hear a continuous high pitched screeching or squealing sound, immediately turn off the engine! You may have over tightened the belt which would prevent the belt from turning and caused the crankshaft pulley to rub the belt. To loosen an over tightened belt, loosen the lower 14mm bolt, loosen the upper 12mm bracket bolt and then rotate the long 12mm tensioner bolt a few turns in the counterclockwise direction. Be careful when touching the belt as it may have become hot from spinning. Check that the longest run of the belt can be rotated 90 degrees perpendicular to the belt around the pulleys. Then tighten the 14mm and 12mm bracket bolts again. If you hear an occasional "chirp, chirp, chirp" noise and you can see that the belt is spinning, you may need to slightly tighten the tensioner. A slightly loose belt tends to sometimes slip and can cause that intermittent chirp, squeak or squeal sound. To slightly tighten the belt, loosen the 14mm lower bolt, the 12mm upper bracket bolt and then turn the long 12mm tensioner bolt a few turns in the clockwise direction ("lefty loosy, righty tighty"). If you adjusted the tension on the new belt, start the engine again and listen for any noises. If the belt is quiet and seems to be spinning smoothly at idle, try revving the engine to see if the belt makes any sounds. Line up the four friction fasteners on the underside of the plastic engine cover with the four metal pegs on the top of the engine and push it down in to place. Be sure to record the belt change in your vehicle's service records.